The crib in question is the IKEA SINGLAR baby crib. About 6000 have been sold in Canada. The four main bolts that hold the mattress down are not long enough and could be the reason for collapsing if incorrectly assembled. 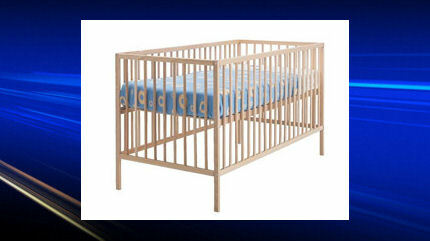 IKEA urges customers with the crib to check it immediatly. If the mattress support bolts extend through the nuts, the crib is fine. If not, IKEA is saying that they have a free repair kit to help the crib.